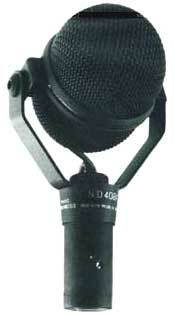 The ND408a represents a radical departure from conventional designs. The unique pivoting yoke allows maximum flexibility in head positioning near a sound source. The use of neodymium magnet assembly provides 6dB more output sensitivity over conventional magnets. Suitable for drums, percussion, guitar/bass amps.